If you are a shooter and you have not heard of or used a 1911 by now, you should definitely get off our website and buy one or rent one as soon as possible! The 1911 and 1911A1 are one of, if not THE most popular handguns in history. They have a design that has stood the test of time and has proven itself on the battlefield multiple times. Winchester/Olin has been a massive ammunition production plant for military cartridges, with the 45 ACP Full Metal Jacket or Ball round among them. Even though it is not a NATO spec round, the .45 ACP is still one of the most popular pistol rounds and the most well-known subsonic handgun round on the market today. 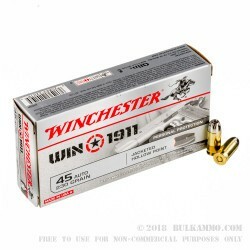 Besides being topped with a .45ACP, Win 1911, 230 grain nickel-plated copper jacketed hollow point bullet, the rounds are loaded into new, heavy walled, reloadable, non-corrosive Boxer primed brass cases straight off the Winchester Olin factory floor. They have a muzzle energy of 395-foot pounds and a muzzle velocity of 880-feet per second. 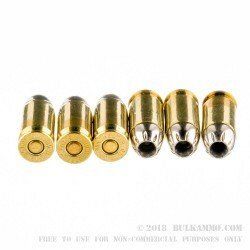 While they are an ideal Concealed Carry round, they are also a great option for trips to the shooting range, family shooting trips, or any competitions you want to enter. 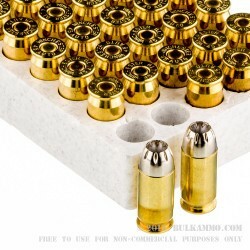 These defensive rounds come in a large, 50 round box that’s perfect for topping off all your 1911 mags and any other 45 platforms you may need to feed. Get yours today.